I had to make the perilous crossing today for grocery shopping and a fast food fix. First before going onto the causeway, the traffic was backed up and at a stand still for a while. Gradually it began to move, very slowly. There had been a three car accident and the police were still there, but the cars were pulled over to the side, on the first island. It looked as though someone got rear-ended and then bumped a car that was in front of them. You think it was a 'texting' accident? 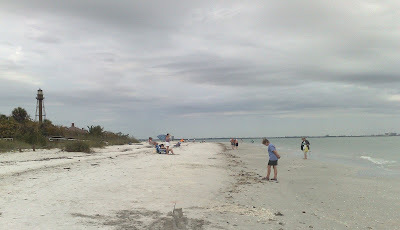 There were LOTS of people fishing from the shore of the spoil islands today. Made a stop at Lighthouse Beach late this afternoon. 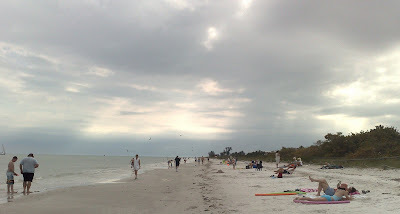 There were still a lot of people around enjoying the 80 degree, partly cloudy afternoon. The nice gentle waves are back today. The forecast says it will be partly cloudy the rest of this week, with the temperature staying around 78 to low 80's during the day. Should be a wonderful week for visitors. Although, I didn't see many shells on the beach today. A friend said that there were some, in spots on the beach, further west. Thanks so much for the blog comment! I have bookmarked your blog and plan on visiting it anytime I need to relax for a bit--love the videos!! It really is such a wonderful place. *waves hi* I thought I was going to come over on Sunday, but it was raining so I just stayed home. Snowbird said she got some good shells over the weekend due to the high waves. Which daughter is coming down? Hope all is well with yooze guyz. We had a wonderful trip to the Smokies. We stayed in an awesome cabin. You'll have to check out my blog. Ahh, warm weather...brings those darn tourists! :) Hope the shelling picks up. I think 80 and cloudy just isn't as warm as 80 and sunny. I hope the sun shines through tomorrow. We had 30's and nice, and then it started snowing tonight. That's cruel. 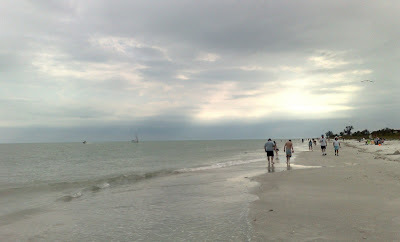 It looks like you had a perfect day there on Sanibel. Thanks for sharing it with us.